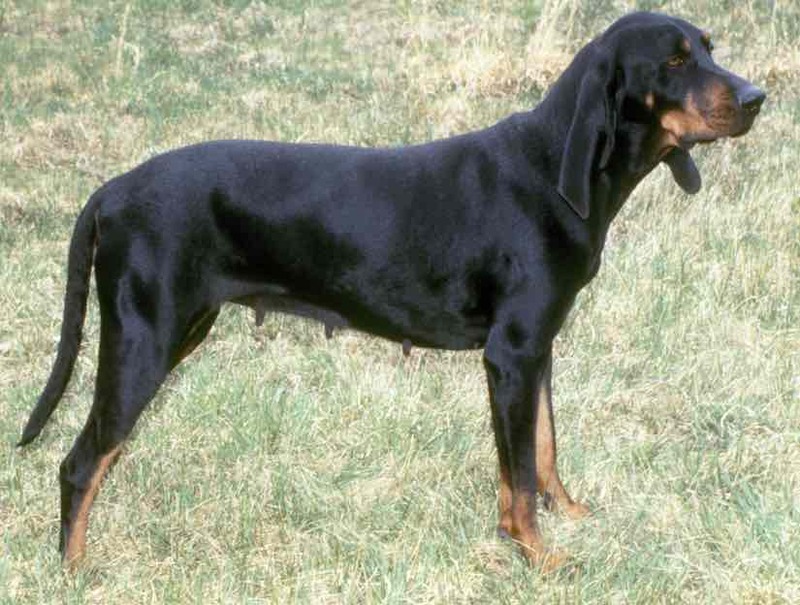 Black and Tan Coonhound is a dog breed from the USA. 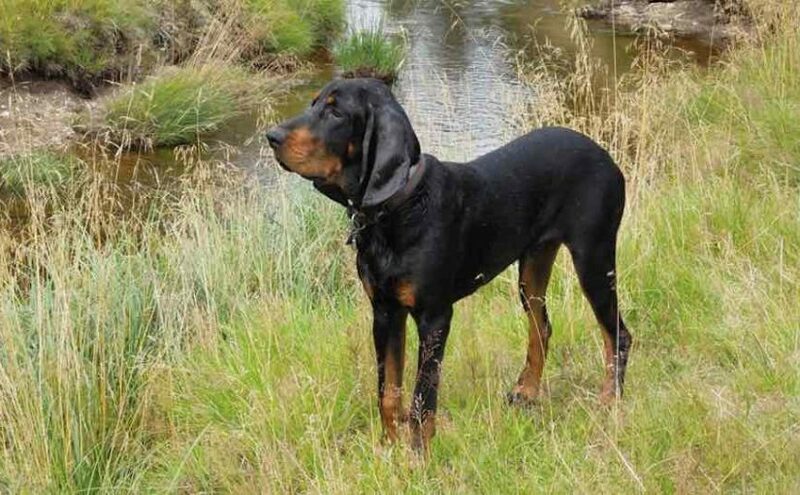 The outgoing and friendly black and tan coonhound is a versatile companion who shines in the show ring and field. At home, he’s a superb playmate, jogging or walking companion, and bed warmer. 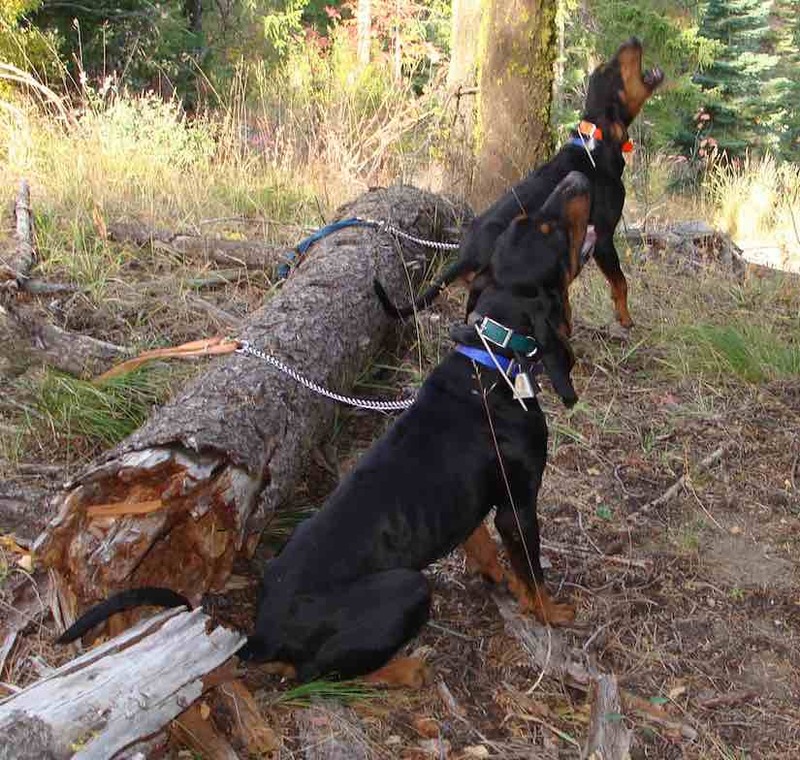 Because of his strong hunting instinct and specialized skills, the Black and Tan Coonhound is rarely thought of as a family dog. Still, for people who admire the hound’s independent nature and sense of humor, he can make an excellent companion and when at home he tends to be laidback, playful, and gentle. 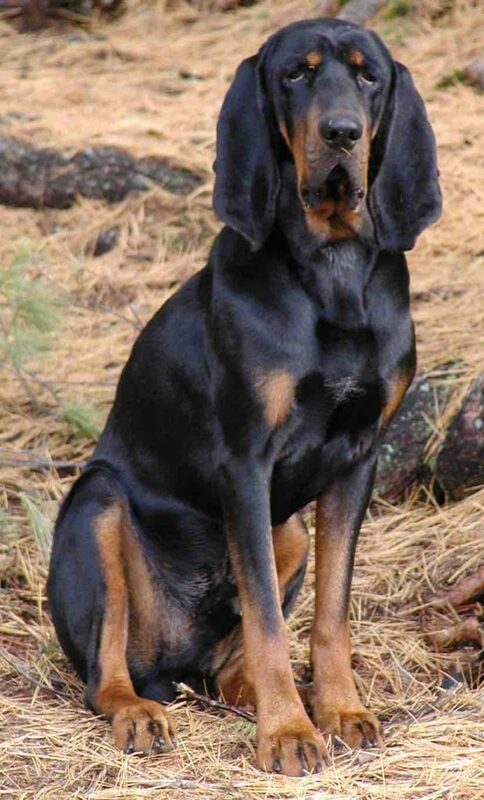 General Appearance: The Black and Tan Coonhound is first and fundamentally a working dog, capable of withstanding the rigors of winter, the heat of summer, and the difficult terrain over which he is called upon to work. Judges are asked by the club sponsoring the breed to place great emphasis upon these facts when evaluating the merits of the dog. The general impression should be that of power, agility, and alertness. His expression should be alert, friendly, eager, and aggressive. He should immediately impress one with his ability to cover the ground with powerful rhythmic strides. Measured at the shoulder: males, 25-27 inches (64-69 cm); females, 23-25 inches (58-64 cm). Height should be in proportion to general conformation so the dog appears neither leggy nor close to the ground. Dogs oversized should not be penalized when general soundness and proportion are in favor. Coat and Colour: The coat should be short but dense to withstand rough going. As the name implies, the color should be coal black, with rich tan markings above eyes, on sides of muzzle, chest, legs and black pencil markings on toes. Head: The head should be cleanly modeled, with medium stop occurring midway between occiput and nose. The head should measure from 9-10 inches (23-25 cm) in males and from 8-9 inches (20-23 cm) in females. Viewed from the profile the line of the skull is on a practically parallel plane to the foreface or muzzle. Skull should tend toward oval outline. Nostrils well open and always black. Teeth should fit evenly with slightly scissors bite. Eyes should be from hazel to dark brown in color, almost round and not deeply set. Ears should be low set and well back. They should hang in graceful folds giving the dog a majestic appearance. In length, they should extend well beyond the tip of the nose. The skin should be devoid of folds or excess dewlap. 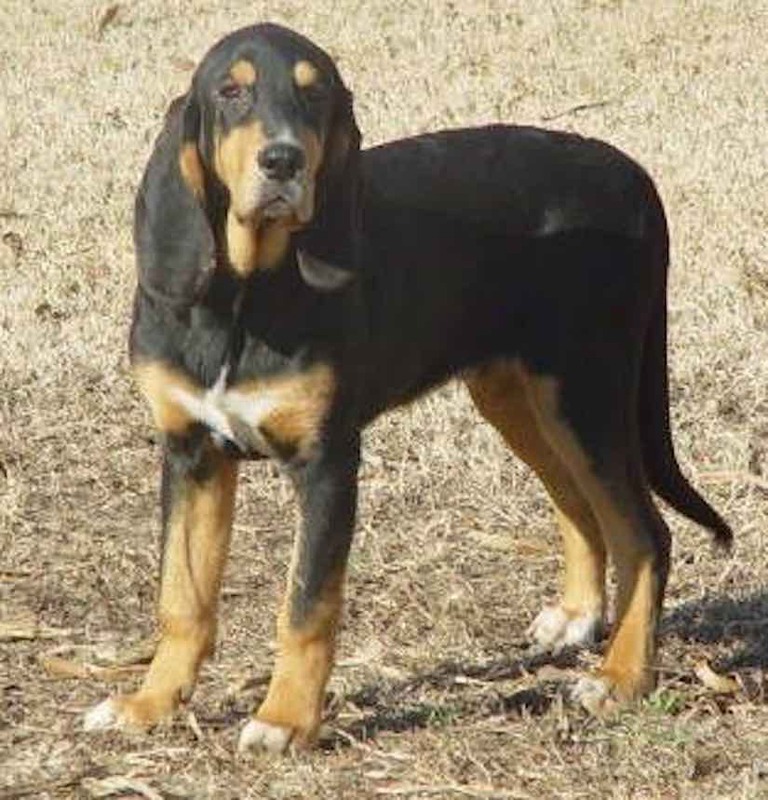 The flews should be well developed with typical hound appearance. Neck: The neck should be muscular, sloping, medium length. Forequarters: Shoulders powerfully constructed. The forelegs should be straight, with elbows well let down, turning neither in nor out; pasterns strong and erect. Feet should be cat-like with compact, well-arched toes and thick strong pads. Body: The back should be level, powerful and strong, with a visible slope from withers to rump. The chest should be deep. The dog should possess full, round, well-sprung ribs, avoiding flat-sidedness. Hindquarters: Quarters should be well boned and muscled. From hip to hock long and sinewy, hock to pad short and strong. Stifles and hock well bent and not inclining either in or out. When standing on a level surface, the hind feet should set back from under the body, and leg from pad to hock be at right angles to the ground when viewed both from the profile and the rear. Tail: Should be strong, with the base slightly below the level of the backline, carried free, and when in action, at approximately right angle to back. Gait: The stride of the Black and Tan Coonhound should be easy and graceful with a long reach in the front and drive behind. Faults: Judges should penalize the following defects: undersize, elbows out at the shoulder, lack of angulation in hindquarters, splay feet, sway or roach back, flat-sidedness, lack of depth in the chest, yellow or light eyes, the presence of shyness and nervousness. Dewclaws are a fault and should be removed. White on the chest or other parts of the body is highly undesirable. Disqualification: White on the chest or other parts of the body if it exceeds 1-1/2 inches (4 cm) in diameter.